The Green Bay Packers have been one of the bigger surprises of the season. They were expected to be competitive; maybe even a Super Bowl caliber team. But then they lost to Vikings, Cowboys, and then embarked on a four-game losing streak where the team’s play has brought the coaching staff’s job security under fire. Playoffs? Playoffs? Not for this 4-6 team—but then it happened. The team needed a massive turnaround just to end the losing streak let alone make the playoffs. From how the team has played and who it has on the roster, there was little reason to believe even the losing streak could come to an end. But it did Monday night against the Philadelphia Eagles. Why? Because Aaron Rodgers and the Packers finally played like the guys fans have come to know and love. Rodgers guided the team to a pair of touchdown drives (with an Eagles touchdown drive sandwiched in between) to start the game; both ended in touchdown passes to Davante Adams and gave the Packers an early lead. Adams would finish the night with five receptions for 113 yards and two touchdowns. It was his second multi-touchdown day of the season. The confident, accurate, and effective leader was back—but then the team had reason to fear Rodgers might be gone. Early in the second half, he appeared to hobble off the field and then disappeared into a tent the Packers had set up on the sideline. He eventually re-emerged and returned to the game. After the game, he told the media he injured his hamstring on the first drive of the half, and that he’d be good to go for next week. The running game was still anemic for the Packers. James Starks only managed 41 yards on 17 carries, but the man of the hour ended up being fullback Aaron Ripkowski. With his one-yard plunge to cap off a 13 play, 75-yard drive in the fourth quarter the Packers recorded their first rushing touchdown by a running back this season. Mason Crosby would add a field goal later in the quarter to make the final score 27-13. 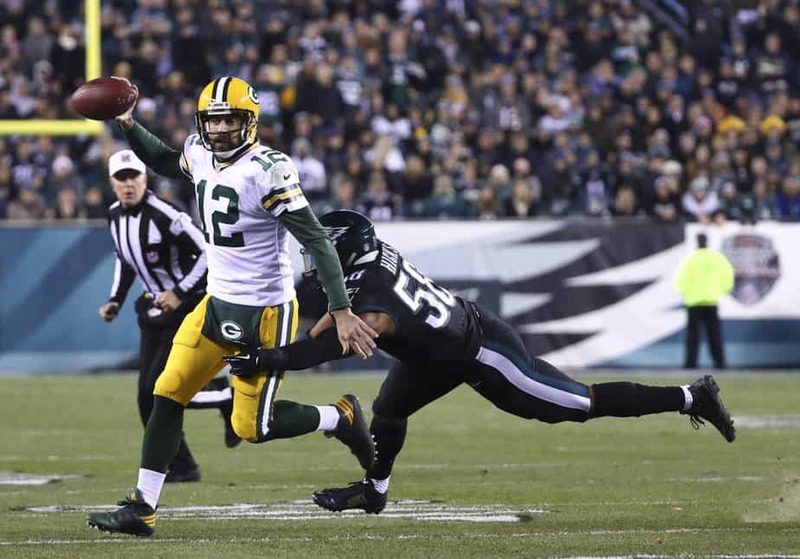 Rodgers ended the night with 30 completions in 39 attempts for 313 yards and a pair of touchdowns. It’s the fourth time this season he’s thrown for 300+ and third consecutive game. Of the team’s six offensive possessions, he guided the team to points on five of them. Wentz didn’t play poorly, but he didn’t get much help from the rest of his team. He was sacked four times and ended up being the second leading rusher on the team with four carries for 33 yards and his first rushing touchdown. The defense failed to sack Rodgers even once. With the win, the Packers improve to 5-6, but they will likely need to win the division if they are going to make the playoffs, and they are still two games behind the Detroit Lions in the NFC North. But they could very well run the table if they continue to play like they did Monday night. The Packers have games remaining against the Texans, Seahawks, Bears, Vikings, and wrap up the regular season against the Lions. 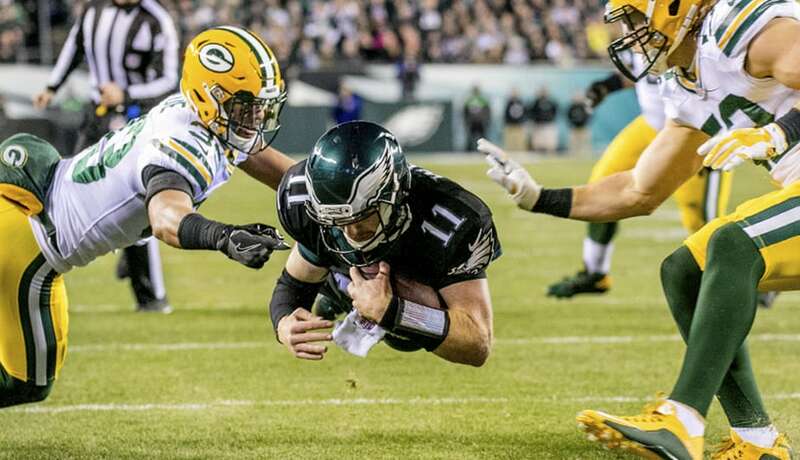 As for the Eagles, with a record of 5-6, they are in last place in the NFC East, and it is unlikely they will be able to catch either the Washington Redskins or New York Giants.